Celebrate and share the new olive harvest with our gift box assembled for the festive occasion. Drizzle the KATZ Organic December's New Oil (that was just harvested a few weeks ago) onto freshly toasted artisan bread from your local baker, use the Napa Valley made ceramic coaster to place the bottle on the dining table for more drizzling, add the KATZ Farm Fleur de Sel to the olive wood mise en place dish, and use the olive wood scoop to sprinkle onto the bread...ethereal...we promise! The warmed bread will intensify the aroma and flavor of the new oil, and the fleur de sel adds another dimension to the tasting. 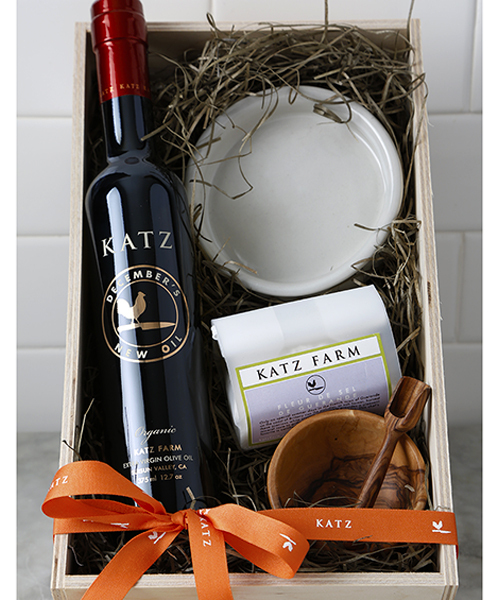 All of the above come handsomely gift wrapped in our custom KATZ wooden crate (8" x 13" x 4") with a note about tasting the new harvest olive oil. Please note: this gift ships in December.